… on Easter Saturday all Volunteers were notified to get Confession on Easter Saturday night and (to be less conspicuous) to travel to outlying districts for Communion on Sunday morning. The hour of mobilisation was 10.15 Sunday morning, the centre Ua Buachalla’s store… I wanted to give the honour of announcing the starting of the Rebellion to Ua Buahcalla. His example and his patriotism had kept us together. He always was a self-effacing man. He insisted that I would make the announcement. I cannot recall what I said, but it was something about we going out in rebellion, I emphasised the seriousness of what we were about to do and I remember well saying that if any member wished to withdraw no hard feelings would be held. No Volunteer withdrew. We were about to issue the guns, ammunition and pikes when a messenger on a motor cycle arrived with a message from Eoin MacNeill, addressed to Ua Buachalla, cancelling any movement of Volunteers. We hung around discussing the matter. Before we dispersed a further message to Ua Buachalla from P. H. Pearse ordered us not to leave our district but to await further orders. We never received further orders. The following answered the call: Domhnall Ua Buachalla, Liam Ó Raogain, Seán Graves, Patrick Kearney, John Kenny, Joseph Ledwith, Matthew Maguire, John Maguire, Timothy Tyrell, Thomas Mangan, Patrick Colgan. I had decided not to mobilise Patrick Kirwan, he was a married man with five small children; without his small earnings they had nothing to live on. All the party had not reported before I was called to the store door where I found Kirwan in a towering rage due to my omission to call him. I tried to reason with him about his helpless family, all to no avail, he had lived to fight for Ireland, etc. I admitted him, he proved himself during the week in Dublin to be a courageous fellow. While we were awaiting the Volunteers to mobilise a message was received from Eamon O’Kelly (a native of Maynooth) and Organiser for the Irish Volunteers, that he and Captain Byrne were on their way to join us. O’Byrne, O’Kelly and Tom Harris of Prosperous arrived to us at 6 p.m. We had gained a new Volunteer during mobilisation, Oliver Ryan, a Dublin man employed on the indoor staff, Maynooth College. He told me he wanted to take part in the fight with us. I told him we had no gun to give him; from under his overcoat he produced a .22 rifle and ammunition; we took him on. What a grand fellow he proved to be, until he died in the South Dublin Union, and unknown, some ten years back. On approaching the Phoenix Park I heard firing, I think it was from the Magazine Fort in the Park. I proceeded down the northern quays. At the Mendicity Institute there were British soldiers taking cover under the Liffey wall on the north side of the river and avoiding the firing which was coming from the Institute. They did not stop me and I passed through. Further down the quays near the Four Courts, the Volunteers had a barricade across the street. I was halted here. I told the officer who was in command here who I was and where and for what I was going. He let me pass through. I proceeded to No. 2 Dawson St. which I knew to be the Headquarters of the Volunteers, but found the place locked up. I started back for home and travelled via the N. C. [North Circular] Road. The British had a barricade on the street near Phibsboro Church. It was situated between Doyle’s corner and the Church. I was allowed through here again without any interference. I cycled through the Park and back to Maynooth. On reaching Maynooth I found Tom Byrne of Boer War fame, and Tom Harris there. Byrne had come on from Prosperous. I do not know if he was sent down by Volunteer Hqrs. to take charge in Kildare. The Maynooth Volunteers had mobilised in the yard of my house. There were about fourteen men present all told. They had the sporting guns and some rations. Having a spare gun, we took him along. Patrick Kearney asked to be released from his promise to take part. He was excused. John and Edward Kenny asked permission to go home to say farewell to their mother; they failed to return. Thomas Magee and Patrick Ledwith were absent at Fairyhouse races; they failed to report. As far as I can remember, the O’Neill brothers, having failed to mobilise on Sunday morning, were not mobilised on Easter Monday. So our total strength was 15. Whilst waiting for Captain Byrne to arrive, I sent John Maguire to Dunboyne to mobilise the Dunboyne Company. He spoke with Sean Boylan and arranged to have the Dunboyne men meet us at Leixlip Railway Station at 8 p.m. 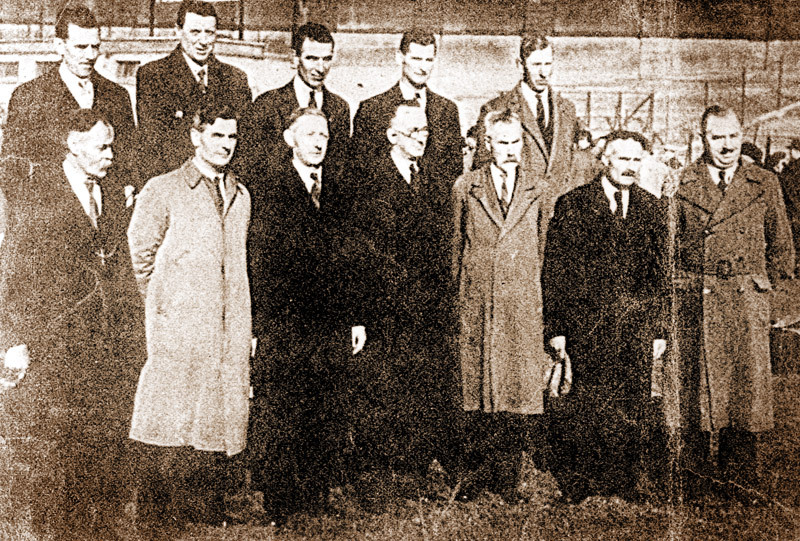 The Dunboyne men, who numbered about thirty, left to keep the appointment before Maguire left Dunboyne. It appears they went about a mile on the journey and then returned home. Before we left Buckley’s store all of us knew we were going to attempt to reach Dublin. To mislead the R.I.C., we marched down Maynooth [Main] street in the direction opposite Dublin and towards Maynooth College. The people left their houses to see us pass. We had to use a bit of persuasion on a would-be helper, James Murphy, who, having a few drinks over the normal, insisted he was coming with us. Two members of the R.I.C., Constables Peter Cleary (one of the Belfast R.I.C. strikers) and Michael Nolan, formed up behind us but desisted when Eamon O’Kelly presented his revolver and threatened to fire. We entered Maynooth College by the main gate. I suggested we would look up John Kenny, who was employed as personal servant with the College President. We found him in his quarters; he said the President would not let him come with us. The President, Very Revd. Monsignor Hogan, came on the scene and appealed to us to return home. He told us we were poor fools who were going to be slaughtered. I was cheeky enough to contradict him. He told me I was an impertinent fellow. He then appealed to Ua Buachalla to go home; failing, he said ‘If you kneel down I’ll give you my blessing.’ He gave it. We left Maynooth College by the back gate leading to the canal banks. We proceeded along the canal banks as far as Pike Bridge, about a mile on the Dublin side of Maynooth. We then proceeded along the railway line. … about two or three in the morning. Hiding our guns in the tower, we lay down under some trees and slept – at least I know what I did – for now and then I was awakened by the heavy rifle fire going on in the city. When the cemetery gates opened later in the morning, Tom Byrne went out to reconnoitre. He returned with a report that the way to the G.P.O. was clear and thereupon we recovered our rifles from the tower and marched out. Many of the residents were on the streets or in their windows. Some of them advised us to go home or we would be slaughtered, others cheered us on. When we reached the Parnell Monument a terrific rifle fire barrage greeted us. We thought we were being attacked and we all raced for the shelter of the monument. It turned out to be a volley of rifle shots from the occupants of the G.P.O. to welcome us. As we neared the G.P.O. the garrison cheered us on. We entered the G.P.O. by the main entrance. Comdt. General Connolly was at the door. As we entered he shook each of us by the hand and smiled his welcome to us. Connolly was one of my heroes. I had never before met him. I felt all excited that he would show such an interest in us. We were marched in to the main hall of the building where we were greeted by Kildare men who were members of the garrison: Frank Burke, Mícáil Cowley, Tom Brien, Mick Croke, Paddy Byrne and others. We were issued with mugs of tea and buns by Brian O’Higgins. When we had finished eating Comdt. General Pearse spoke to us. His words have remained with me since. I think of them with great pride. He told us how glad he was to have us with them in the fight; that our action in marching from Kildare, even if we did no more in the Rebellion, would gain us a place in history. He then outlined the position to us. He did not expect any action at the G.P.O. for days. The Citizen Army at St. Stephen’s Green was hard pressed and had not sufficient men. A group of Volunteers were cut off at the Dublin City Hall and ‘Evening Mail’ Office. He gave us the privilege of selecting our own post. He added, “The opinion is a rescue party at the City Hall would have little chance of surviving.” As one, we all shouted “the City Hall”. We were marched out to the G.P.O. yard to the magazine. Here we had further cause for pride in learning the Volunteer in charge was Jim O’Neill, a native of Leixlip. I handed over the powder I had brought from Maynooth. O’Neill made me feel I had saved the Rebellion by my contribution. With the knowledge that my name would live in history and that I had made a great contribution with the 8 lbs. of powder to the success of the Rebellion, I felt elated. Apart from the Maynooth Volunteers there were at least seven people from Co. Kildare in the GPO garrison: Frank and Eva Bourke (Carbury), Jim O’Neill (Leixlip), Michael Cowley (Kilcock), Tom Brien (Timahoe) and Paddy Byrne (address unconfirmed). Mick Croke, mentioned by Pat Colgan as being a Kildareman, was from Dublin. The Maynooth Volunteers fought throughout Easter Week in the GPO and in Parliament Street. Two of them – Tom Harris and Ted O’Kelly – were wounded. Lt. O’Kelly was brought to Jervis Street Hospital, from where he subsequently escaped. Capt. Tom Byrne also managed to avoid capture. Following the surrender Joe Ledwith, Pat Weafer, and Jack Graves, managed to escape the cordon. They returned to Maynooth, but were promptly arrested and sent to Hare Park Prison, the Curragh. From there they were sent to Richmond Barracks, Dublin, along with a further fifteen local republicans arrested in the general roundup following the Rising. The remaining men of the Maynooth contingent surrendered at Moore Street. Twenty-nine Kildaremen and one woman served in the various rebel garrisons in Dublin during Easter Week and around fifty Kildaremen were subsequently imprisoned in Frongoch Internment Camp and other detention centres in England.